Ahhh this is so awesome! I've went on Ebay a few times to look at some of the MAC pieces but couldn't ever justify the price of them so this is a great alternative, I just really hope my local Walgreens will still have some of these in stock now lol. Kind of a shame the quality is just subpar, but I'm definitely with you on just buying it for collection purchases more than anything! The whole collection looks awesome! I'm a giant Disney lover and the blusher looks amazing and definitely something i'd love to buy! My favourite Disney Villain is Maleficent! This is a great giveaway & looks like an awesome collection. I adore Disney and I see videos and blog posts about these collections all the time it's such a bummer we can't get them here in the UK. I'd probably be like you and just use them for the packaging lol. 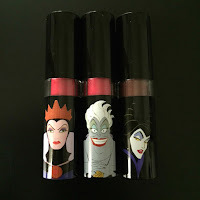 Ursula is my favourite Disney villain & I think her lipstick is my favourite! 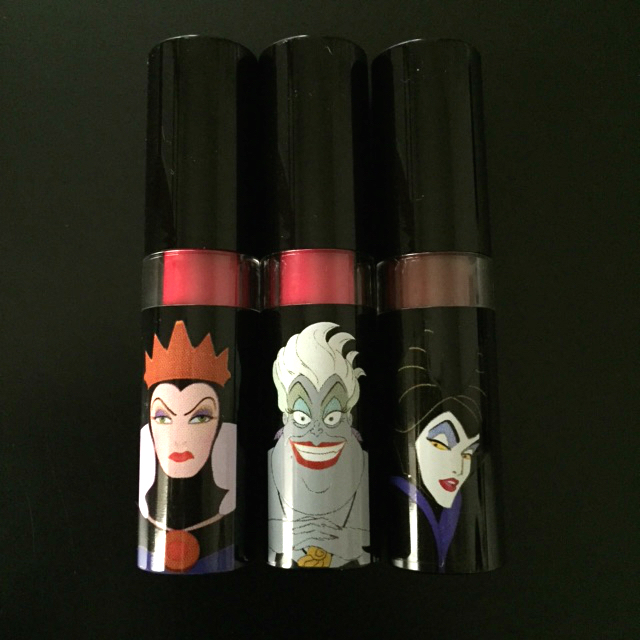 I laugh these are too cute perfect for a Halloween giveaway anything disney rocks. That is some great packaging, I can see why you had to have it! These are SWEET eitherway!! So cute! The colors are STUNNING! My favorite would have to be Maleficent. Love the colors in this collection. The Evil Queen cause I love her look! I'm such a sucker for these collections because I love everything Disney lol!! And I have to agree with you Kim that I really only buy them for the packaging and to collection, but I still love to have them. I wanted to try to find the Ursula palette from this collection but never did. Ursula is my favorite because I love little mermaid haha! I think Disney villains are more popular than princesses because their characters are so much more interesting - they have flaws and failings, while their poor princess counterparts are so perfect that its hard to stay interested! Maleficent has always been my favourite, I even dressed up as her for my first Halloween. I'm not really a collector except for lipsticks (and I have way too many right now) so I likely won't be rushing to get these products, but they do look cute. How neat! :) I'd say my fave is Maleficent but I may be swayed by the movie I saw :) Fingers crossed! I do love Disney and I can see why you bought these, Kim because I would too if I saw these here. LOL! Shame the quality is quite up to par but hey the pretty packaging makes up for it! And thank you so much for another great giveaway, Kim! MAC's timing is always perfect. These are beautiful colors for the season, with HALLOWEEN coming and all. I actually love these colors on you, Kim! 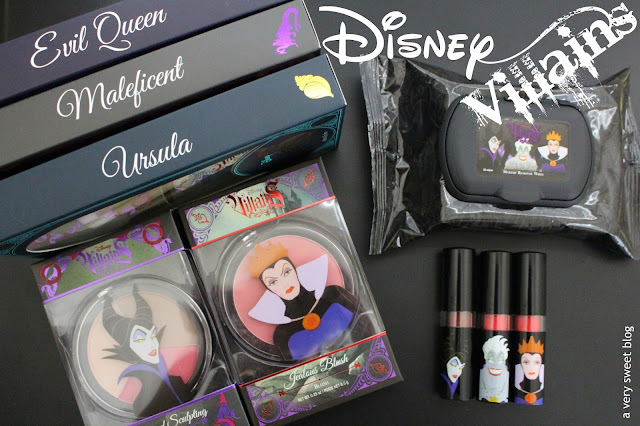 My favorite Disney villianess is Ursula!I love the packaging on these! I am such a sucker for limited edition packaging! This is such an awesome collection!!! I really love the dragons lair lip shade, it's such a beautiful chocolate brown. I am a huge sucker for anything with cute packaging so I totally love these! Although, not sure I could see myself using them but the packaging sure is pretty! CRUELLA!!! haha. the packaging is always the fun part in these collections. The makeup brushes are so cute:-) The lipsticks look very pretty on you. My favourite villian is the evil queen in Snow White. Ooooh gotta love Maleficent! I'd say she's my favorite. I love the dark brown lipstick, and I've actually been on the lookout for a color like that for fall! Fingers crossed for this giveaway! I need to try those too. What a fun post! This has reminded me of a bright pink lip balm I picked up at Disneyworld Florida when I was eight - it was love at first sight haha! :) I love the look of the blusher, it's so bright and feminine. The packaging is so fantastic! I guess makeup is like wine. I sometimes will pick up a wine with a fun label like zombies. They are never tasty! Yzma's one of my fave villains. "Wrong lever!" What a fun collection. That's wonderful that it will go into your collection. this is the coolest collection ever!! love the packaging! I would love to, but never get these limited edition sets! It's too bad the lipsticks are too dry. At least the brushes look good! The illustrations and the packaging....priceless! I can see why you want to collect this make up collection:):)!!!! I love the packaging on these! It looks every bit as good as the MAC collection and so much less. Even though the product may not be as great, at least it isn't expensive. Kim, you always find the cutest makeup. I love the evil queen too. Hehe. How are you doing? I've been crazy swamped with work, I don't have time to work on my blog. Thanks for keeping us updated with the reno!